With the kids home yesterday for Veterans Day, I was a little lazy and hung out in my PJ's for awhile. The only thing I had to do was return a pair of pants I bought for my son that didn't fit to Value Village. I had to do it as it was the last day I could and since I had spent a whopping $14.99 on them, I knew I had to go. So off I went in the soggy Oregon rain. Well, since I was headed that way anyway, I decided to stop at Goodwill to see if they had anything good. I ran into my friend Bobbie and spent some time chatting with her. Then I found a few things I thought were neat that I could resell. Next stop was Value Village where they were having a Veteran's Day Sale. 50% off everything! It was packed, but I was tickled to find several good things. Here's what I scored yesterday. The shelf, ceramic turkey (on the shelf) and hand painted lamp all came from Goodwill. 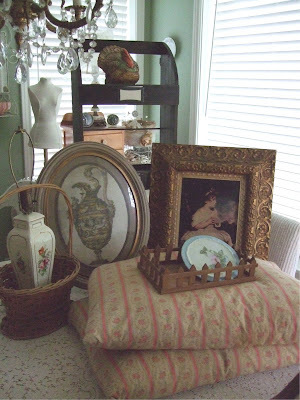 The down ticking pillows, basket, picket tray, hand painted trivet, and two prints came from Value Village. Last week when I was at the Salvation Army buying the mini dress form, I asked if they ever get any full sized ones in and the gal there said they do sometimes and they could call me if they ever get any in. So I left my name and number. On Monday afternoon I got a call from SA saying they had just gotten a dress form in and wanted to let me know. She described it to me and told me the price, but it didn't sound like something I really wanted. Anyway, since I was right by SA yesterday (it is literally right around the corner from Value Village) I stopped in to check it out. Well, long story short, here is my new friend. I just love her. I don't think I have ever seen one with this great cranberry colored fabric and the base is a neat cast iron. At first I thought I would buy her to resell, but, don't you think she looks great tucked in the corner in my living room? She goes perfectly with my curtains. So, now I need to give her a name. Any suggestions? Heading over to Monticello today for some drop off and fluffing. Hope you are having a great week! great buys,your friend is lovely,her name should be Rose of course! I was going to suggest Rose, but I see that lady of the mote already beat me to it! I think she looks like a "Ruby". Rose is also nice, but Ruby was what first came to mine when I saw her! Kudos on the fab finds! I live up in the Seattle area and have a SERIOUS addiction to Goodwill, especially the Goodwill Outlet. Value Village and Salvation Army (I can walk to one from work on my lunch hour)also call my name frequently. I love the treasure hunting!! Best wishes! Ruby is good, but I like Sherry or Cherry better. You really found some wonderful things. I thought of going to Value Village in Gladstone yesterday but I'm inside with a cold! You could name her Sally since her last home was the Salvation Army! For some reason, the name "Matilda" seems to suit her. What a great find! And I can't thank you enough for the generous gift of wallpaper you sent my way, it made my day!!!! Just to let you know, something will be coming back your way cause of your genorosity....thanks again my friend! Or... you could name her Score! Ok, you totally scored! I can see it never hurts to asks. I need to get better at that. Scarlett seems fitting to me. Lucky girl!! Ahhh...She looks almost like mine! I found my girl at Good will the same time Christina Applegate announced she had Breast Cancer and was getting a double mastectomy. My girl doesnt have a lot up top going on... and yet she is still beautiful! So in honor of Breast cancer awareness, I named my dress form Christina! Good luck naming your little lady! Wow, all those good names. Like Adrienne I thought of Sally, and since she's from the 'army', and you got her on Veteran's Day, well, next a title, Sgt. Sal, but then I love Scarlett and Rose and Cherry and Ruby. Matilda is sweet too. Waltzing Sgt. Sally Matilda, Rose, Ruby with a cherry on top. Hmm...getting carried away here. Good luck with your new gal Sal!